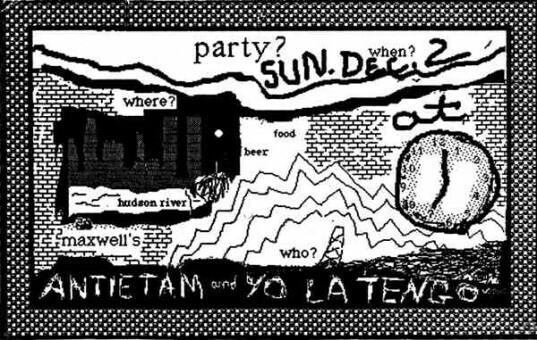 If you’ve been following my daily posts on yolatengo.com, you’re probably aware that December 2 marks the 30th anniversary of our first show. We’re throwing ourselves a little commemorative shindig. It starts on the December 3 and 4, at New York’s Town Hall. Sharing the bill with us will be Antietam, just as they did in 1984 at Maxwell’s. The following night we’ll have the Feelies. Glenn Mercer played a song with us that night at Maxwell’s, and Bill Million was the first to record Georgia and me, years before we formed the band. December 5, the party moves south of the Mason-Dixon line to D.C.’s 9:30 Club with our pals Lambchop on hand to lend some southern gentility to the evening. And then it’s one more show with Antietam, at the Trocadero in Philadelphia on December 6. Hope you can help us celebrate.